With tails swishing and heads bobbing we found these three boys in a lush, green clear cut meadow trying to ward off the swarms of flies and mosquitoes. With lots of rain and some warm temperatures the grass is growing thick and tall and of course along comes the insects. The bugs seem especially abundant this early in the year. In order to alleviate some of the stress of enduring these pests, you find the wild horses rolling in the mud and in areas where the wind can keep some of them away. In our travels yesterday we put on hundreds of kilometres checking on the status of the wild horses and the rangeland that they inhabit. No matter where we went we found vast tracks of untouched grass with only a few deer and the odd horse. 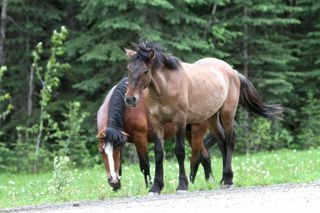 This disputes the claims that the horses are decimating the range prior to the great number of cattle being turned loose to graze on their summer leases and allotments. To us it also shows that no matter what there is adequate forage for all. Don’t forget that the grasses are the fastest growing and yearly renewable resource out there. 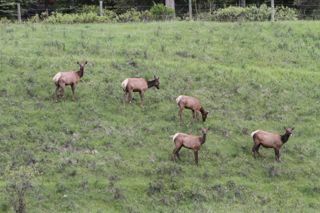 One of our other observations is the increase in the elk herds that we are coming across. In finding a lot of these elk they are intermingled with the horses sharing the same range. In one small area there was close to 150 head of elk with numerous calves. The University of Alberta has students conducting research on these elk populations. Maybe one of the reasons they are moving lower is that in one of the prime calving grounds that we know about, has been taken over by dirt bikers who conduct races throughout this area. 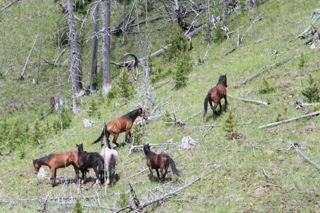 This activity has not only disrupts the elk, but other wildlife including the wild horses. One of the things we also noticed was how few yearlings there were around. 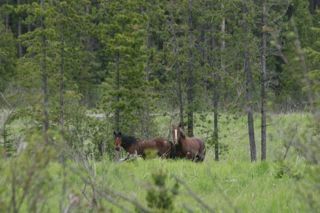 We came across these two – the yearling on the left and a three-year old boy resting in another clear cut area. It is obvious to those of us who spend a lot of time out west that this past winter severely affected the herds. This also is pointed out in the number of mares we see right now that must have aborted their pregnancies in order to survive themselves. This is nature. 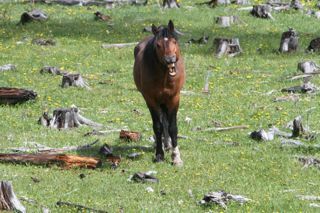 We also know that this spring mares have died giving birth and foals that were born have not survived. Normally this yearling would still be with its mother. What happened to her? We can only assume she perished in the harshness of winter. Sadly this is proven by the number of carcasses of dead horses we and others are also finding. Here is another young boy that should be with his mare and herd but he only has his buddy, maybe a three-year old, with him. He was such a curious young fellow, that when we were taking pictures of him, he walked right up to within 8 feet of us. Certainly a heart grabber! 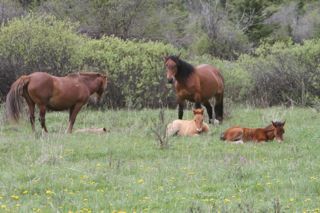 On the positive side we are finding some of the herds, but not all, have foals with them. 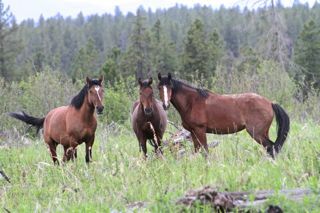 In some cases it may be only one, but here in Thor’s herd, we have 3 healthy young foals. With the grasses and warm weather coming it is hoped that they will grow strong along with all the other babies born. This young fellow seems to be indicating how happy he is that sunshine and abundant feed has finally arrived.